Equity is an abstract concept covering philosophical issues such as fairness and social justice, making its definition and measurement complex. This volume tackles these complexities head-on. The book is enriched with many empirical analyses and provides a comprehensive analysis of equity ranging from concepts and measurements to empirical illustrations and policy implications. After an extensive discussion on equity in the introduction, this volume begins with a chapter on well-being where the concepts of functioning and capability are discussed. This is followed by a few chapters on what an equitable distribution is and how equity can be measured. The volume then provides a definition and a methodology to measure equitable growth, examining the relationship between growth, inequality, and poverty. It also presents various empirical illustrations and country-specific experiences with three country case studies which assess whether publicly provided health and education services are equitable in developing Asia, examining the extent to which these social services favor the poor as well as the policy challenges to a more equitable delivery of these services. Finally, these country studies provide evidence-based policy recommendations to improve equity in social service delivery in developing countries. Achieving social equity has long been an important policy goal. There are relatively few studies on equity. 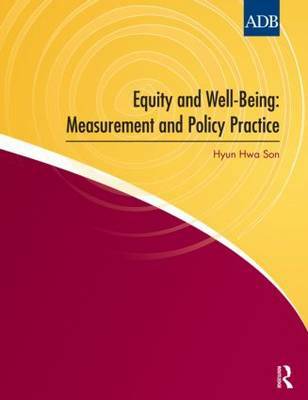 This book aims to help fill this gap with an in-depth analysis of the issues associated with equity, covering its concept, measurement, and policy practices and implications.